Just a little thought for the day. A little tired lately from juggling life as all of us run at 800 mph trying to do whatever it is we feel we want, need, should do. So today, just a happy little thought that hopefully help make it ‘yournewfavoriteday.’ Have a great day and take this moment as you read these words to smile, let your heart give you a warm hug and let the air out of your lungs and know I celebrate you all everyday. Thanks for always helping to make it ‘mynewfavoriteday’ too! ← Can we and should we protect our little girls’ self-esteem? Thanks for the smiles, Shannon! To be honest, i see more of Addie in me every day and it freaks me out!! 🙂 Let’s hope she only keeps the good parts and gets rid of those tiny moments that make me cringe with the realization of the mini-me we created!! 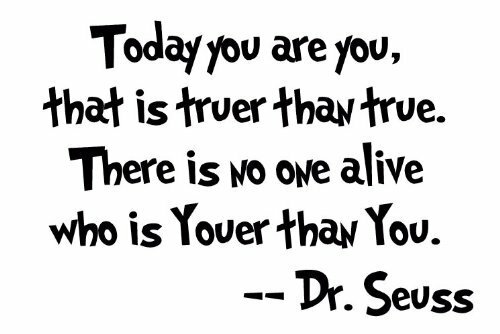 On a more serious note, i do want to put this quote on my kids’ mirror to remind them every day of how great their own darn self is and to not be lured down the road of wanting to be like someone else. Love it – thanks for sharing!! Great blog, I love your positive outlook and inspiring messages. Keep writing. Thanks so much, such a lovely compliment. It really keeps me inspired and motivated to get such nice compliments and to have you here, so thank you.